Neymar broke the news that he was leaving Barcelona for Paris St-Germain at Lionel Messi's wedding, according to his former team-mate Xavi. Neymar and Xavi, who played together for two years at Barcelona, attended Messi's wedding in July. Xavi also told the BBC World Service he turned down Manchester United because Barcelona was his "favourite team". Xavi revealed he held talks earlier in his career with then Manchester United manager Sir Alex Ferguson's brother Martin, who was a scout for the Premier League club. He said: "Sometimes we were discussing with Manchester United and Alex Ferguson's brother to try and join me there. But I decided to stay in Barcelona because it's my club. 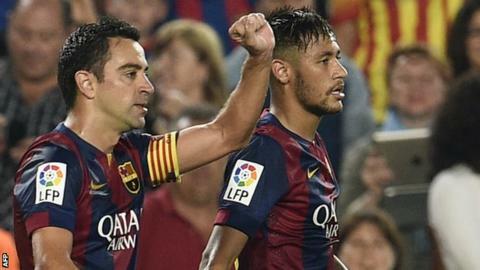 On Neymar's departure, Xavi told the World Football show: "He said to us at Messi's wedding that he wanted to change club. "I said to him but why? He said 'I am not happy in Barcelona, I prefer to leave, to have a new experience in Europe at PSG and finally he did, it was his decision, we must respect it. You can listen to the full World Football show episode here. and download the podcast here.